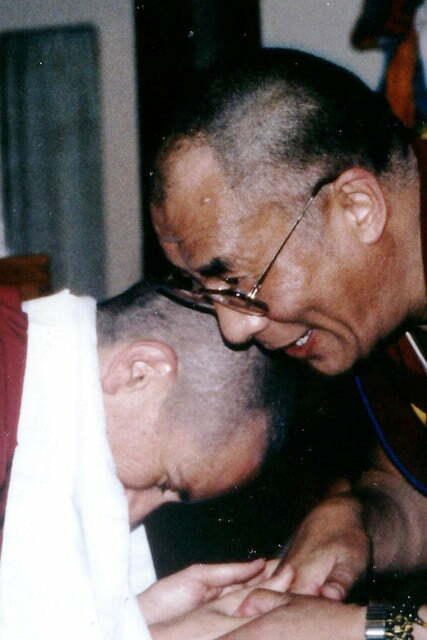 His Holiness the Dalai Lama lit the spark that inspired Ven. Thubten Chodron to found Sravasti Abbey. His Holiness also gave the Abbey its name. Read his endorsement and Ven. Chodron’s tale of why it’s called Sravasti Abbey. I asked His Holiness the Dalai Lama to name the Abbey. His Private Office requested a list of possible names. His Holiness would then either chose one among them or give another name. I put “Sravasti Abbey” on the list for two reasons. One—it was the place where the Buddha spent 25 rains retreat (varsa in Sanskrit and yarne in Tibetan). He spoke many sutras at Sravasti. Second, during the Buddha’s time, communities of both nuns and monks resided at Sravasti. Because I wanted the Abbey to be a place where the pure Buddha’s teachings were abundantly available to both female and male monastics, “Sravasti” seemed auspicious. I added “abbey” because the term is gender neutral, indicating a place for both male and female monastics.. This is the name His Holiness chose.